Published customer imageGrowth factor expression in healing and non-union groups. 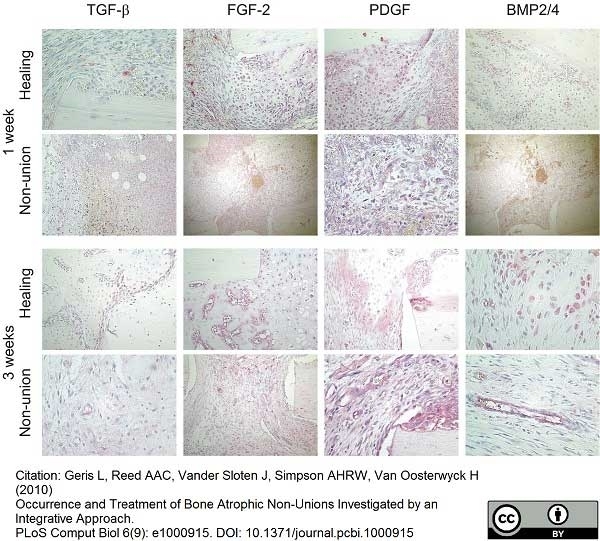 Immunohistochemical analysis of TGF-beta, FGF-b, PDGF and BMP2/4 in healing and non-union groups at 1 and 3 weeks post-osteotomy. Images taken at ×20 or ×40 magnification and positive growth factor staining is seen as a red signal. Occurrence and Treatment of Bone Atrophic Non-Unions Investigated by an Integrative Approach. PLoS Comput Biol 6(9): e1000915. Mouse anti Human TGF beta antibody, clone TB21 recognizes both human platelet-derived and recombinant TGF-beta1 in enzyme-linked immunosorbent assay (ELISA). Mouse anti Human TGF beta antibody, clone TB21 demonstrates neutralising activity against TGF-beta1 in cell proliferation assays. Mouse anti Human TGF beta antibody, clone TB21 has been demonstrated to react with dimeric (~25 kDa) or monomeric (~12.5 kDa) molecules of natural TGF-beta1 under non-reducing and reducing conditions respectively. Human Transforming Growth Factor Beta 1 from platelets. Spleen cells from immunised Balb/c mice were fused with cells of the SP2/0-Ag 14 mouse myeloma cell line. 2 Mouse anti Human TGF β antibody, clone TB21 has been used successfully on FFPE tissues without pretreatment e.g. Bob et al. and Booth et al.. Others have used either citrate pH6.0, EDTA pH8.0 or pepsin mediated antigen retrieval. Bob, F. et al. (2014) Immunohistochemical study of tubular epithelial cells and vascular endothelial cells in glomerulonephritis. Lehr, E.J.et al. (2010) Decellularization reduces immunogenicity of sheep pulmonary artery vascular patches. J Thorac Cardiovasc Surg. 141: 1056-62. Westermann, D. et al. (2011) Cardiac inflammation contributes to changes in the extracellular matrix in patients with heart failure and normal ejection fraction. Circ Heart Fail. 4: 44-52. Brown, H. et al. (1999) Cytokine expression in the brain in human cerebral malaria. J Infect Dis. 180: 1742-6. Helske, S. et al. (2006) Possible role for mast cell-derived cathepsin G in the adverse remodelling of stenotic aortic valves. Eur Heart J. 27: 1495-504. Hsiao, Y.W. et al. (2004) Tumor-infiltrating lymphocyte secretion of IL-6 antagonizes tumor-derived TGF-beta 1 and restores the lymphokine-activated killing activity. Kingston, P.A. et al. 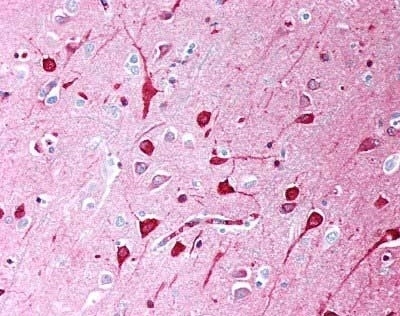 (2003) Adenovirus-mediated gene transfer of transforming growth factor-beta3, but not transforming growth factor-beta1, inhibits constrictive remodeling and reduces luminal loss after coronary angioplasty. Lavaud, S. et al. (2001) Inflammation is probably not a prerequisite for renal interstitial fibrosis in normoglycemic obese rats. Am J Physiol Renal Physiol. 280: F683-94. Sheu, B.C. et al. (2001) Predominant Th2/Tc2 polarity of tumor-infiltrating lymphocytes in human cervical cancer. Hopkinson, A. et al. (2006) Amniotic membrane for ocular surface reconstruction: donor variations and the effect of handling on TGF-beta content. Invest Ophthalmol Vis Sci. 47: 4316-22. Sumpter, T.L. et al. (2007) Regulation of the NFAT pathway discriminates CD4+CD25+ regulatory T cells from CD4+CD25- helper T cells. J Leukoc Biol. 83: 708-17. Braun, N. et al. (2011) Difference in the expression of hormone receptors and fibrotic markers in the human peritoneum--implications for therapeutic targets to prevent encapsulating peritoneal sclerosis. Perit Dial Int. 31: 291-300. Shi, W.K. et al. (1993) [Biological characterization of a monoclonal antibody TB 21 against human transforming growth factor-beta 1]. Shi Yan Sheng Wu Xue Bao. 26: 141-50. Bob, F.R. et al. (2011) Histological changes and immunohistochemical markers in the assessment of glomerulosclerosis in patients with glomerulonephritis. Rom J Morphol Embryol. 52: 1027-32. Lyras, D.N. et al. (2010) Temporal and spatial expression of TGF-beta1 in an Achilles tendon section model after application of platelet-rich plasma. Foot Ankle Surg. 16: 137-41. Fernandez, T. et al. (2002) Disruption of transforming growth factor beta signaling by a novel ligand-dependent mechanism. J Exp Med. 195: 1247-55. Omer, F.M. and Riley, E.M. (1998) Transforming growth factor beta production is inversely correlated with severity of murine malaria infection. J Exp Med. 188: 39-48. Calveley, V.L. et al. (2010) Genistein can mitigate the effect of radiation on rat lung tissue. Paalangara, R. et al. (2003) Intestinal exposure to a parasite antigen in utero depresses cellular and cytokine responses of the mucosal immune system. Vet Immunol Immunopathol. 93: 91-105. Mahmood, J. et al. (2011) Mitigation of lung injury after accidental exposure to radiation. Ueda, S. et al. (2003) Transforming growth factor-beta1 released from the spleen exerts a growth inhibitory effect on liver regeneration in rats. Moussay, E. et al. (2006) Escherichia coli Shiga toxin 1 enhances il-4 transcripts in bovine ileal intraepithelial lymphocytes. Vet Immunol Immunopathol. 113: 367-82. Nicotina, P.A. et al. (1997) Segmental up-regulation of transforming growth factor-beta in the pathogenesis of primary megaureter. An immunocytochemical study. Br J Urol. 80: 946-9. Hu, H-Y. et al. (2016) ATRA alleviated endometrial fibrosis in a rabbit intrauterine adhesions model through downregulation of the TGF-β1/smad4 signaling pathway. Int J Clin Exp Pathol 9(6): 6171-8. Yusup, A. et al. (2015) Bone marrow lesions, subchondral bone cysts and subchondral bone attrition are associated with histological synovitis in patients with end-stage knee osteoarthritis: a cross-sectional study. Osteoarthritis Cartilage. 23 (11): 1858-64. Elkabir, M.A. et al. (2016) Efficacy of azithromycin and metronidazole combined therapy on rats' gingival overgrowth induced by cyclosporine-A: An experimental animal study. J Oral Biol Craniofac Res. 6 (3): 219-226.